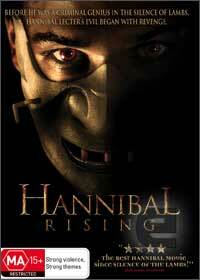 Hannibal Rising is the prequel to the popular Silence of the Lamb series that features Hannibal Lecter as a flesh eating serial killer. This movie adaptation is based on the novel by Thomas Harris that explains the madness and motivations behind this genius. The tale begins in Lithuania during World War II as the Lecter family castle is about to be swarmed by Nazis and the seeds of Hannibal's (Gaspard Ulliel) cannibalism is planted when he witnesses a gang of local collaborators slaughter his sister Mischa (Helen Lia Tachovska) and feed parts of her body to Hannibal. After this disturbing scene (fortunately much of the disturbing content happens off screen), the movie moves to post-war France where Hannibal is studying to become a doctor at university and is housed with his recently widowed aunt, Lady Murasaki Shikibu (Gong Li). With their incestous relationship growing, Shikibu attempts to focus Hannibal's energies on them, however Hannibal is driven by revenge in this clichéd thriller. The tale is directed by Peter Webber who fails to successfully link this movie to the original films from the refined Anthony Hopkins as Hannibal Lecter to this Eastern European Nazi hunter bent on revenge. Viewer discretion.